The first part of this video makes full use of slow-motion, stop-action, & graphics to present you with a clear analysis of the essentials of distance fly-casting. The second part of the program contains 10 comprehensive lessons you can use to teach yourself to cast longer & more powerfully - step by step & at your own pace. Everything from perfecting the back cast to perfecting the double haul is detailed. The last 2 lessons show you how to deal with wind, & how to cast sinking lines & weighted flies. Supplemented with a 41 page manual, this info-packed program. 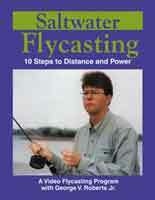 Valuable learning tool for all students of fly-casting, advanced as well as beginner. 90 min.